After staying up too late Thursday night searching maps for Isaac Hunter’s Tavern, Friday morning I pulled up a Google Search which corrected me on the actual location. My friend and fellow armchair historian, Mike Legeros, took my 2010 post and ran with it, connecting with Hunter descendent Betsy Hunter Amos along the way. Betsy is a 7th generation neice of Isaac Hunter who connected with me via email shortly after my 2010 posts, offering photos and family history to fill in the blanks. What Mike and Betsy showed me was that the building I thought was the tavern is not the tavern at all. The real tavern is the building on the far western end of the property, not the ramshackle building I saw behind the home in the 1959 aerial photograph. The grand home itself was the home of Judge Biggs and went by the equally grand name of Hardimont. You can read more about it on Mike’s excellent website. 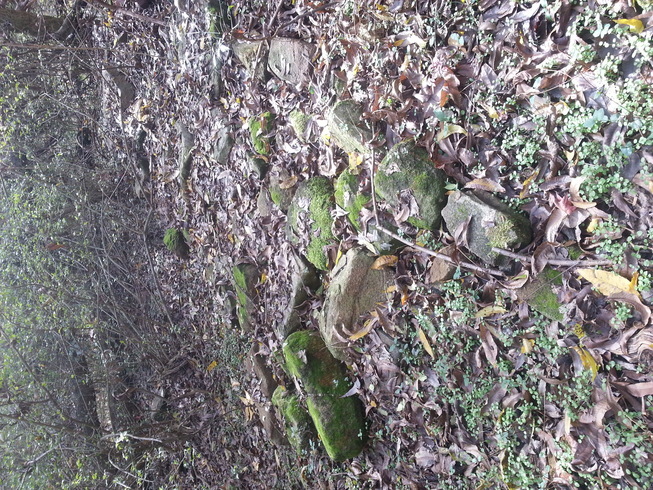 Tavern site as it appears today. 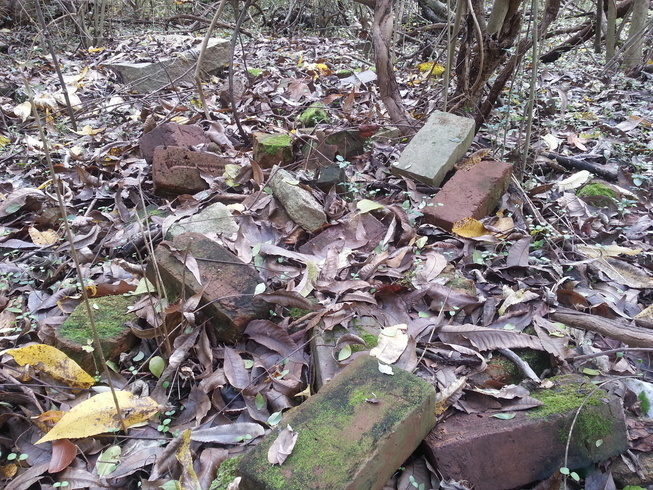 Stones and bricks are on the right. I visited the North Raleigh Hilton at lunch Friday to see what I could see. As Betsy said, the hotel library has a wonderful display of tavern photographs as well as artifacts from the tavern. 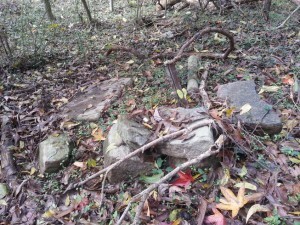 One handy annotated photo showed how the tavern was originally positioned at the “top of the key” or driveway, across from where Hardimont was built. 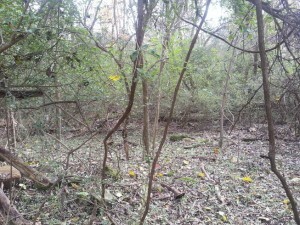 You can easily imagine it as it once stood between the “Lafayette Oaks” in the photographs. Judge Biggs moved the tavern out from in front of his stately home in 1936 and put it 100 yards west. It remained there until sometime in the early 1970s, when it was bulldozed. 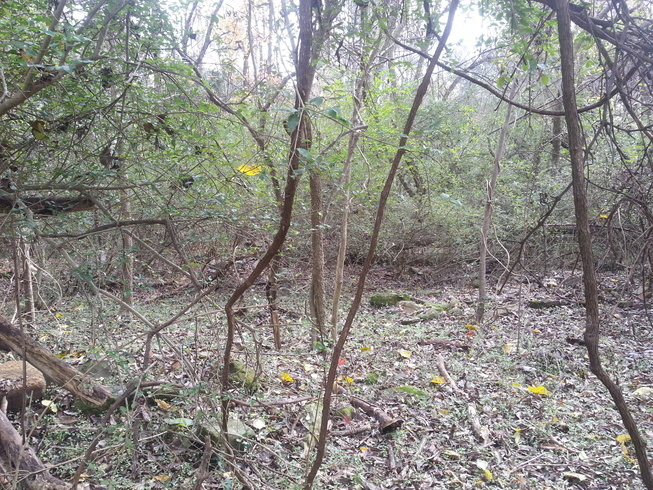 With a little time on my hands, I decided to venture into the woods behind the hotel to see if I could locate the old site. After a few minutes of wandering I came across a clearing. To the left of me was a few mounds of raised dirt. 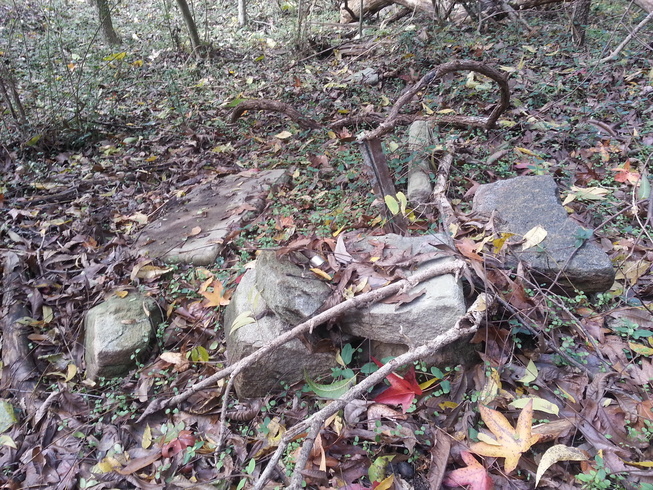 A closer look showed a pile of large stones and brick. It was the foundation of the old tavern! I whipped out my cellphone camera and snapped photos of the bricks and stones. A concrete bench that once provided respite in the beautiful backyard gardens lay in sections to the left of me. 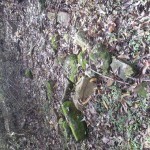 Near it is a set of stones seemingly configured in a step formation. Could these be the old horse mounting stones that once stood outside the tavern? Broken bench from gardens, and are these the mounting stones on the right? 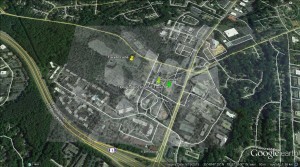 I quickly turned on my phone’s GPS and got a fix of the foundation site. After returning to work, I compared my coordinates to the historical photographs. Bingo, it fits! 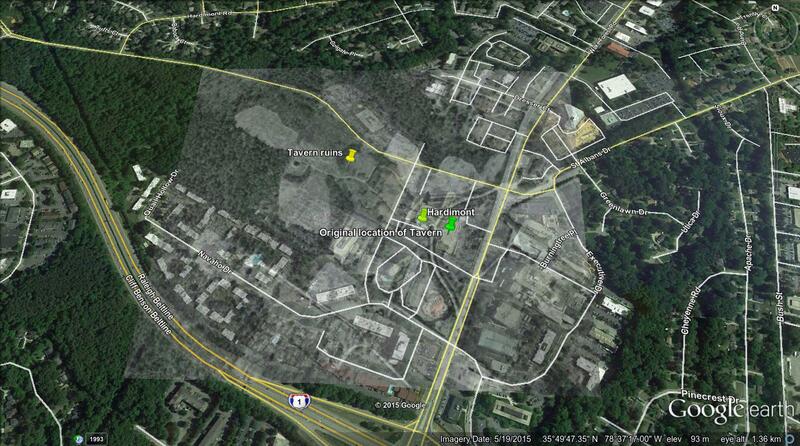 For those who would like to visit what’s left of the tavern, it can be found at 35°49’52.3″ N 78°37’21.5″ W. Surprisingly, its last location is not on hotel property but the parcel directly behind it (roughly 900 St. Albans Drive), so if were bulldozed due to potential development that development never came. Perhaps it was demolished after being deemed a hazard. Accounts say that local historian (and current Apex resident) J.C. Knowles was supposed to take ownership of the tavern but it was bulldozed before he got it. I will try to get up with Mr. Knowles to see what he might know or remember.